A pair of sports reporters took Movember a step further by having their facial hair dyed to raise extra money for charity. Russell Claydon and Sam Murley, who work on the sports desk at the Anglia-based Bury Free Press and Suffolk Free Press, had their newly-grown moustaches painted in the colours of their favourite football teams, Crystal Palace and Ipswich Town. The move helped boost funds for the Bury Free Press Beat It appeal, which is raising £55,000 for a new prostate scanner at West Suffolk Hospital in Bury St Edmunds, Suffolk. Russell and Sam swelled the appeal by more than £850 with hundreds of pounds donated at the Fox and Hounds pub in Thurston, Suffolk. 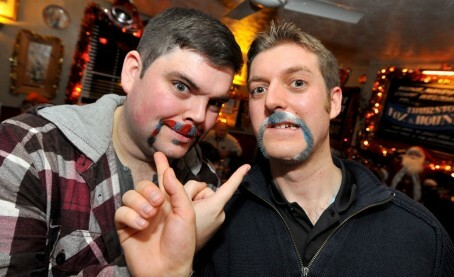 Sam Murley, left, and Russell Claydon show off their moustaches painted in the colours of their favourite football teams. The pair also kept their colourful moustaches covering football matches at AFC Sudbury and Bury Town football clubs, with the team’s respective managers managing to keep straight faces in post-match video interviews for the Suffolk Free Press and Bury Free Press websites. Anglia Newspapers’ group sports editor Derek Bish and photographer Ben Carmichael had also taken part in the month-long challenge to grow their moustaches and earn money for the charity, but were not quite as brave as Sam and Russell. “We took quite a lot of stick from our colleagues in the Bury Free Press offices for our attempts to grow facial hair, but it certainly did not deter Sam and Russell from taking it even further,” said Derek. Fantastic effort. Wouldn’t it be great if Johnston Press’s management doubled the amount these guys have raised?